I love the way my children sometimes clean their rooms. They will take all their stuff that is out and covering everything and shove it their closet and under the bed. If you can’t see a mess, there isn’t a mess. I was thinking about something similar these recent days when snow came down to cover everything I could see, or I should more correctly say, covered everything I could not see. I looked down my street and for a brief period of time, the entire neighborhood was spotless and perfect. All imperfections were covered in a blanket of white. Of course, it was that same snow that caused many problems for people all up and down the East Coast, including many traveling to and from the March for Life in Washington, DC. Many were stranded on highways, unable to get home after spending time speaking out and marching for the unborn. One image struck I saw in social media struck me. 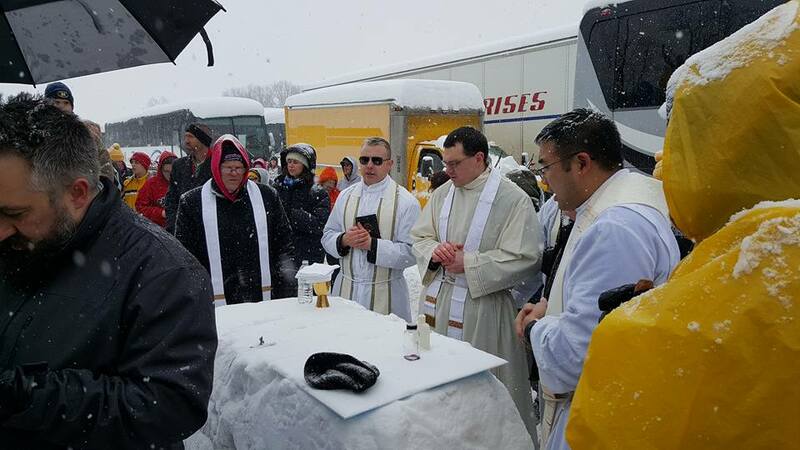 An altar made of snow, on the side of the highway, and a large crowd of people attending Mass. This awesome sight amazed me. And I thought to myself, this snow covers the land and makes all things beautiful like the sacrifice of Jesus Christ takes away our sins and makes all of us beautiful. On the side of the highway a crowd of people led by a few priests gave witness to a power much greater than the power of winter weather. And for God, He doesn’t simply hide our sins under a blanket of white, or shove our transgressions in a closet, but takes them away… permanently. And God remembers them no more. We remain imperfect for we have not yet joined God in a perfect union in the next life. However, when God looks at us He doesn’t see a mess. He sees something beautiful.